I was hooked ever since I saw them at Kalyn's Kitchen. 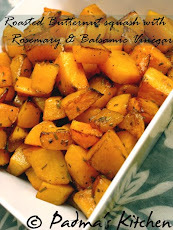 Man she has some of the awesome varieties in her blog with great choice of veggies that can go in. I suggest you do take some time and check in those muffins. I wanted to blog this post much before, it was sitting in my drafts for more than four months now. The ingredients used in this are simple and easy to find like basil, green onions, your choice of cheese and milk. You can play with the ingredients by adding mushrooms, carrots, broccoli, red peppers, asparagus, cooked meat like turkey, chicken etc. Preheat oven to 375 degrees F/185 degrees C and oil spray the muffin tray. Crack the eggs in a bowl, beat it so that the yolks are mixed well with the egg whites. Add milk, garam masala, freshly ground black pepper, cayenne pepper and salt and stir well. Bake for 25-30 minutes until slightly browned and cooked. Makes 8-9 small muffins. Serve hot with your favorite bread or simply eat with tomato ketchup. The feta cheese flavor burst like butter in your mouth. For healthy option try with egg beaters or only egg whites. These freeze well, so you can freeze it for later use, if you have excess. Store it in ziploc bag and for best results, thaw it in refrigerator before microwaving it. Wrap in a paper towel while reheating it in microwave as sometimes they release liquid. For more tips visit Kalyn's Kitchen. 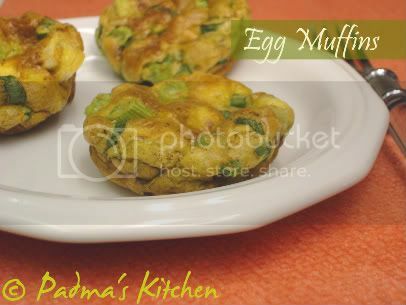 Looks adorable those eggswith feta cheese in muffin tins, i make it for my kid to attract him by shape :) Perfect breakfast! This was one of Kalyn's recipes that I had wanted to try... Yours look like they turned out perfect and delicious! I posted egg muffins too my blog a few months back. I think I followed a recipe that was inspired by Kalyn's . :D Since then I 've been making it regularly. Love the addition of basil! I remember seeing it at TBC's blog - sounds delicious Padma. These look so yummy and perfect for Sunday morning breakfast!